Traveling and will furnish updated charts when I have the time and better internet access. Interesting week just past. 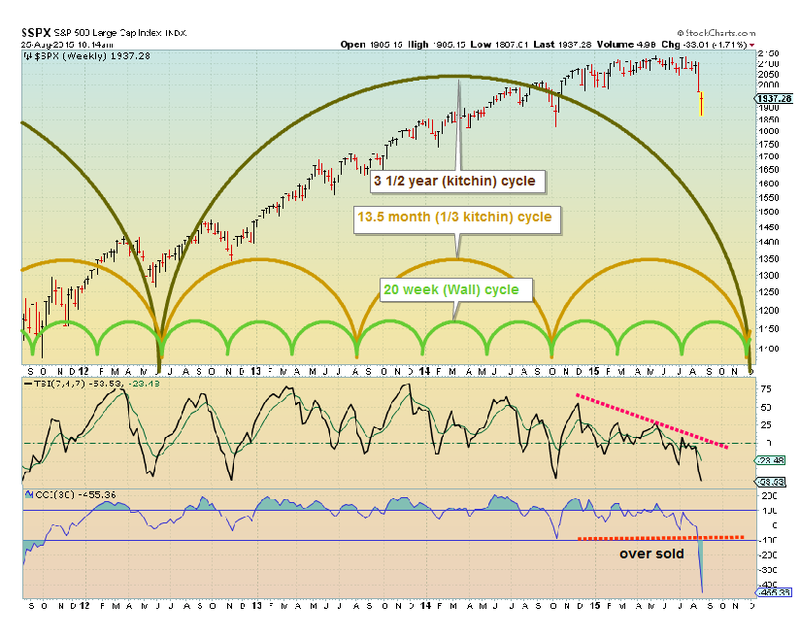 Mid year I posted a longer term outlook. I posted longer cycles (Kitchin cycle 3 1/2 years) and 1/3 Kitchin cycle (13+ months). . Also noted that a down turn in these longer cycles would accelerate in the last 15-20% of the cycle and these cycles should dominate during that time frame). 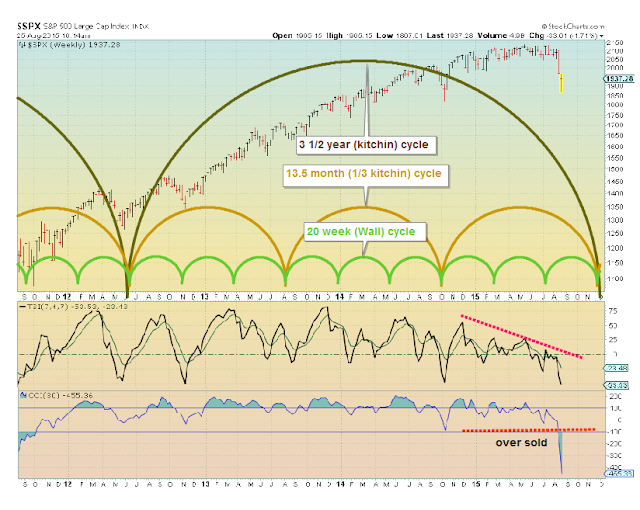 Projected bottom on these longer cycles is around year end. We may have now entered that down draft from the longer cycles as the up turn in shorter cycles seems to be totaled dominated. I told you the first couple of weeks after the nested bottoms would tell us if we were entering a longer term trend change.... I suspect we have and will take a closer review of this past week's action. .
Appears longer cycles have taken over to the down side and should control for most or all of 2015. Since down moves tend to be shorter and cover a lot of amplitude in a short time expect moves to be volatile and violent. Also research "Jubilee" in regards to 7 year cycles. Those expecting a Stock Market crash on September 13, 2015 (elul 29) [September 14, 1st trading day]; expect to be disappointed!